The Hunger Games are coming out on DVD in less than three weeks, and we are having a party at my house to celebrate. I was the only one out of my group of friends who caught the movie in theatre (it only played for 4 days here since we only have one theatre… with one screen), so I thought why not all view it together? Actually, it was my friend Jenn’s idea, so I have to give her props for that! 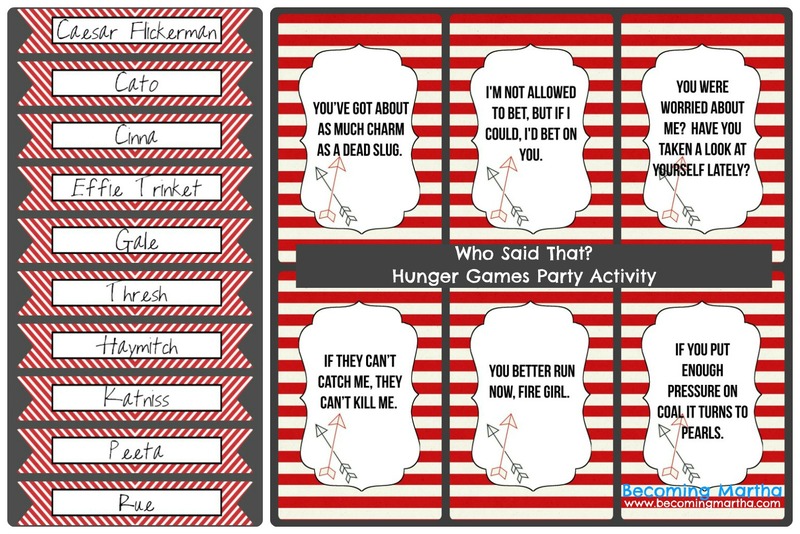 While the party activities will mainly consist of movie watching and eating (all HG themed food of course!) I wanted a couple of little things to do while we waited for everyone to arrive. I also wanted these little things to double as decor. I have a few ideas, but here’s the first – a Who Said That? trivia game. and then place a small piece of velcro on the bottom. The names will all be cut out and have a piece of velcro attached. Then guests can mix and match the pieces until they get them all right. Super simple, easy, and cute to look at. I do have a dilema though – red or orange? The party colors are black, gold, red, and orange/yellow. The menu tags are orange, so I was thinking about keeping these red, but I’m not sure. What do you think? **These images were created using the Live Life Free kit by Digital Design Essentials. I like the red! What a fun idea! Love Hunger Games!! Can’t wait to see what you throw together! I am going to have to play this with my sister. I hope you share pictures of your party. I’m curious to find out what HG themed food means. We’d love to have you come! 🙂 I have a feeling though that would be unrealistic. And yeh, I’m gonna stick with the red. How do you download the files? Or were these not made for download? Hi – no I didn’t make a printable for these. Sorry!